Keeping up its pledge to provide 360 degree development to its PGDM students, GLBIMR under the transformational leadership of Mr. Pankaj Agarwal, Vice Chairman, GL Bajaj Educational Institutions. Dr. Urvashi Makkar, Director General, GLBIMR, organized wide arrays of activities to provide all-round development and corporate exposure to its faculty and students during December 2018. GLBIMR organized “Sankalp 2k18” an Inter-Institute Annual Cultural Fest, interactive sessions on “Stress Management for becoming successful corporate professional ” by Shri V.K. Bansal, Dr. Pooran Chandra Pandey & Deepika Shergil, 12th Management Development Program (MDP) on “Financial Planning & Wealth Management”, an interactive workshop on “Financial Management for Effective Decision Making” by Dr. Satish Kumar, two days certification programme on “Advanced Microsoft Excel” by MSME, special session on Marketing Management II by Dr. Sanjiv Mittal, Professor, GGSIPU, Delhi , a special yoga session on “Yog Se Nirog” by Shri Ramnish Vatsa,“Warli Art Contest” for PGDM students as part of Art & Culture Club, an international seminar I&ESC 2018 on Innovation & Entrepreneurship in the Smart Cities of India at IIT Delhi and an interactive Panel Discussion on “Changing Landscape of Finance: A Career Perspective”. 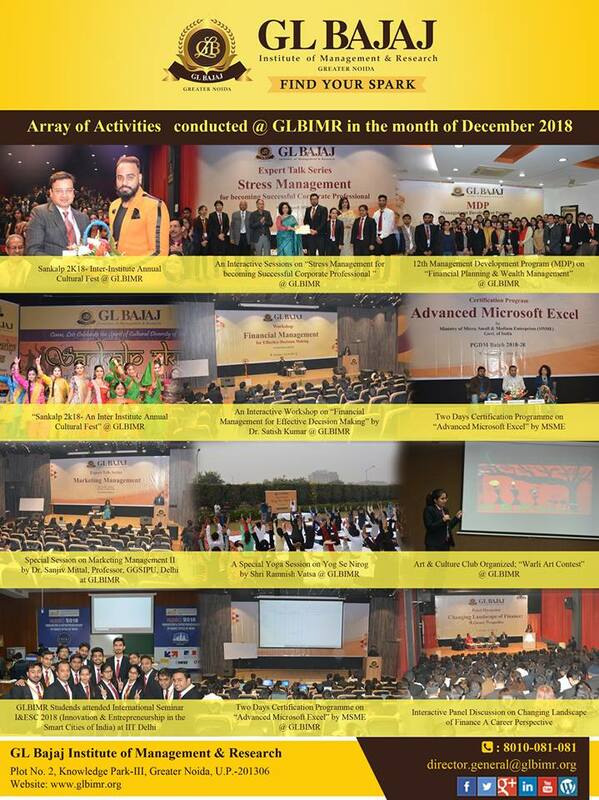 All the events received huge success at GLBIMR and the month of December was full of new learning’s, progress and knowledge sharing for all.